This name uses Spanish naming customs: the first or paternal family name is Lopetegui and the second or maternal family name is Argote. Julen Lopetegui Argote (Spanish pronunciation: [ˈʝulen lopeˈteɣi aɾˈɣote]; born 28 August 1966) is a Spanish football manager and former player who played as a goalkeeper. He played 149 games in La Liga over 11 seasons, appearing in the competition for Real Madrid, Logroñés, Barcelona and Rayo Vallecano. He added 168 matches in Segunda División with three clubs, and represented Spain at the 1994 World Cup. Lopetegui started working as a manager in 2003, and spent several years in charge of Spain's youth teams, leading the under-19 and under-21 sides to European titles. He was also head coach of the senior team for two years, being dismissed before the start of the 2018 World Cup following the announcement of his agreement to join Real Madrid after the tournament. Born in Asteasu, Gipuzkoa, Lopetegui started his professional career at local Real Sociedad, where he was barred by legendary Luis Arconada. In 1985, he accepted an offer from Real Madrid, which immediately incorporated the 19-year-old to its B-team. After a loan spell at UD Las Palmas Lopetegui returned, but could never dislodge another veteran, Francisco Buyo, only managing one La Liga appearance during two seasons, a 3–3 away draw against Atlético Madrid as Real were already crowned league champions. He subsequently signed with CD Logroñés, being instrumental as the modest Riojan club consistently managed to retain its top flight status. As Andoni Zubizarreta left for Valencia CF in 1994, Lopetegui joined FC Barcelona, battling – and losing – for first-choice status with longtime understudy Carles Busquets. After the Catalans bought FC Porto's Vítor Baía he was further demoted to third-string, and returned to Madrid with Rayo Vallecano, being a starter in two of his five seasons (although he still managed 36 league appearances from 1999 to 2002, with Rayo always in the top division, as he retired subsequently). Lopetegui's performances at Logroñés earned him his sole cap with Spain, coming on as a substitute for Zubizarreta for the final 30 minutes of a 0–2 friendly loss with Croatia in Valencia, on 23 March 1994. He was subsequently picked for the squad at that year's FIFA World Cup. Lopetegui was one of Spain coach Juan Santisteban's assistants at the 2003 UEFA European Under-17 Championship. After the tournament, he had his first head coaching spell at Rayo, with the club in the second level, being sacked after the tenth match of the 2003–04 campaign, which ended in relegation to division three; after working as a sports commentator, including for laSexta in the 2006 FIFA World Cup, he returned to coaching, with a side he represented in the 1980s, Real Madrid Castilla, now in the third tier. From 2010 to 2014, Lopetegui worked with the Spanish youth teams, winning the 2012 European Under-19 Championship and the 2013 Under-21 Championship. He left the Royal Spanish Football Federation on 30 April 2014, following the expiration of his contract. Lopetegui returned to club duties on 6 May 2014, being appointed at Portugal's FC Porto. He signed seven Spanish players to the club that summer. In his first season at the Estádio do Dragão, with the club's biggest budget ever, Lopetegui led them to the quarter-finals of the UEFA Champions League, where they equalled the club's biggest defeat in European competitions losing 6–1 against FC Bayern Munich (having lost by the same score to AEK Athens FC in 1978). He failed to win any silverware, contributing to the longest drought during Jorge Nuno Pinto da Costa's presidency. On 8 January 2016, after a 1–3 home loss to C.S. Marítimo in the Taça da Liga, as Porto had already been eliminated from the Champions League and was ranked third in the domestic league after an away loss and a home draw, Lopetegui was relieved of his duties, being replaced by Rui Barros. One week later, the club announced that it had terminated the former's contract unilaterally. On 21 July 2016, after being strongly linked to English side Wolverhampton Wanderers which was under new ownership, Lopetegui was announced as the new manager of the Spain national team following Vicente del Bosque's retirement. In his first match in charge, on 1 September, he led them to a 2–0 friendly victory over Belgium at the King Baudouin Stadium; the nation qualified for the 2018 World Cup, winning nine and drawing one of their group matches. On 12 June 2018, with the team already in Russia for the tournament, it was announced that Lopetegui would take over as the head coach of Real Madrid on a three-year contract after the conclusion of Spain's involvement at the World Cup. The following day, he was dismissed from his job with the national team and replaced by Fernando Hierro. 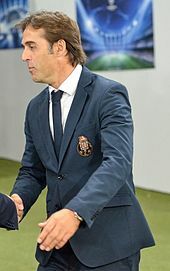 Lopetegui's first competitive game in charge took place on 15 August 2018, in a 2–4 loss against Atlético Madrid for the UEFA Super Cup after extra time. Following a string of bad results and, ultimately, a 5–1 away defeat to Barcelona in El Clásico on 28 October, he was relieved of his duties a day later and replaced by Santiago Solari. ^ a b c d "Julen Lopetegui, de Asteasu a la Selección Española" [Julen Lopetegui, from Asteasu to the Spanish national team]. El Correo (in Spanish). 21 July 2016. Retrieved 12 June 2018. ^ "Toda la suerte de un campeón" [Every bit of champion's luck]. Mundo Deportivo (in Spanish). 29 April 1990. Retrieved 6 May 2014. ^ "El Logroñés confirma su salvación a costa del Cádiz" [Logroñés confirm survival at the expense of Cádiz]. Mundo Deportivo (in Spanish). 21 June 1993. Retrieved 22 February 2014. ^ "Oxígeno para el Logroñés" [Oxygen for Logroñés]. Mundo Deportivo (in Spanish). 4 April 1994. Retrieved 6 May 2014. ^ "Salenko hizo historia con dos goles" [Salenko made history with two goals]. Mundo Deportivo (in Spanish). 16 May 1994. Retrieved 6 May 2014. ^ "Andoni y Julen, juntos" [Andoni and Julen, together]. Mundo Deportivo (in Spanish). 24 May 1994. Retrieved 6 May 2014. ^ "No me doy por derrotado" [I will not surrender]. El País (in Spanish). 8 February 1995. Retrieved 10 July 2014. ^ Muñoz, Xavier (24 March 1994). "Baño croata en la noche de Valencia" [Croatian steamroll in Valencia night]. Mundo Deportivo (in Spanish). p. 2. Retrieved 6 May 2014. ^ "Spain earn fulsome praise". UEFA. 9 May 2013. Retrieved 12 November 2015. ^ "Julen Lopetegui fue destituido" [Julen Lopetegui was sacked]. Mundo Deportivo (in Spanish). 2 November 2003. Retrieved 6 May 2014. ^ Malagón, Manuel (19 June 2013). "El desmayo de Lopetegui" [Lopetegui's faint]. Marca (in Spanish). Retrieved 12 June 2018. ^ "Lopetegui, nuevo técnico del Castilla" [Lopetegui, new Castilla manager]. El Mundo (in Spanish). 11 June 2008. Retrieved 6 May 2014. ^ a b "España sigue haciendo historia" [Spain still making history] (in Spanish). UEFA. 15 July 2012. Retrieved 6 May 2014. ^ a b "Thiago treble helps Spain retain Under-21 crown". UEFA. 18 June 2013. Retrieved 6 May 2014. ^ "Lopetegui abandona el cargo de seleccionador Sub-21" [Lopetegui leaves Under-21 manager position] (in Spanish). Europa Press. 30 April 2014. Retrieved 6 May 2014. ^ "Lopetegui signs as new Porto manager". Marca. 6 May 2014. Retrieved 6 May 2014. ^ "City sign Mangala, Porto turn to Marcano". UEFA. 11 August 2014. Retrieved 12 August 2014. ^ "O maior teste do "formador" Lopetegui" [The biggest test of "former" Lopetegui]. Diário de Notícias (in Portuguese). 26 April 2015. Archived from the original on 20 May 2015. Retrieved 19 May 2015. ^ "FC Porto iguala a pior derrota europeia da sua história" [FC Porto equal worst European defeat in their history] (in Portuguese). SAPO. 21 April 2015. Retrieved 19 May 2015. ^ "O maior jejum da era Pinto da Costa" [The biggest fasting in Pinto da Costa era]. Record (in Portuguese). 17 May 2015. Archived from the original on 13 July 2015. Retrieved 19 May 2015. ^ "Marítimo vence no Dragão e Lopetegui vê lenços brancos" [Marítimo win at the Dragão and Lopetegui sees white cloth] (in Portuguese). Rádio Renascença. 29 December 2015. Retrieved 10 January 2016. ^ "Comunicado da FC Porto – Futebol, SAD" [FC Porto – Football, PLSC announcement] (in Portuguese). FC Porto. 8 January 2016. Retrieved 8 January 2016. ^ "Rescisão unilateral com Lopetegui" [Unilateral rescision with Lopetegui]. A Bola (in Portuguese). 15 January 2016. Retrieved 15 January 2016. ^ "Julen Lopetegui: I'd be Wolves boss now if it wasn't for Spain". Express & Star. 23 July 2016. Retrieved 12 June 2018. ^ "Spain appoint Julen Lopetegui as coach to replace Vicente del Bosque". The Guardian. 21 July 2016. Retrieved 12 June 2018. ^ "Julen Lopetegui appointed Spain's new manager". Agence France-Presse. 21 July 2016. Retrieved 21 July 2016. ^ "Belgium beaten 2–0 by Spain in Roberto Martínez's first match in charge". The Guardian. 1 September 2016. Retrieved 12 June 2018. ^ "Illarramendi rocket gives Spain narrow win in Israel". Reuters. 9 October 2017. Retrieved 13 June 2018. ^ "Official Announcement: Julen Lopetegui will be the Real Madrid coach after the celebration of the 2018 World Cup". Real Madrid C.F. 12 June 2018. Retrieved 12 June 2018. ^ "Julen Lopetegui sacked as Spain manager after accepting Real Madrid job". The Guardian. 13 June 2018. Retrieved 13 June 2018. ^ "OFFICIAL | Fernando Hierro to assume role as head coach for the Russia World Cup". Royal Spanish Football Federation. 13 June 2018. Retrieved 13 June 2018. ^ Sanders, Emma (15 August 2018). "Real Madrid 2–4 Atlético Madrid". BBC Sport. Retrieved 16 August 2018. ^ "Official announcement". Real Madrid C.F. 29 October 2018. Retrieved 29 October 2018. ^ Calabrés, Jorge (29 October 2018). "Solari sustituye a Lopetegui como entrenador interino del Real Madrid" [Solari replaces Lopetegui as Real Madrid interim manager] (in Spanish). El Español. Retrieved 29 October 2018. ^ Villalobos, Fran (12 June 2018). "El día que Julen Lopetegui defendió la portería del Real Madrid" [The day Julen Lopetegui was in goal for Real Madrid]. Marca (in Spanish). Retrieved 13 June 2018. ^ Aguilar, Francesc (31 August 1994). "El Barça paga un precio muy alto" [Barça pay a heavy price]. Mundo Deportivo (in Spanish). Retrieved 1 December 2015. ^ Serra, Josep María (29 August 1996). "Título con súper-susto" [Title with mega-scare]. Mundo Deportivo (in Spanish). Retrieved 20 June 2018. ^ Díez, Óscar (1 November 2014). "España en los mundiales sub'20: URSS 1985" [Spain in the under’20 World Cups: USSR 1985]. Cuadernos de Fútbol (in Spanish). CIHEFE. ISSN 1989-6379. Retrieved 13 June 2018. Wikimedia Commons has media related to Julen Lopetegui.